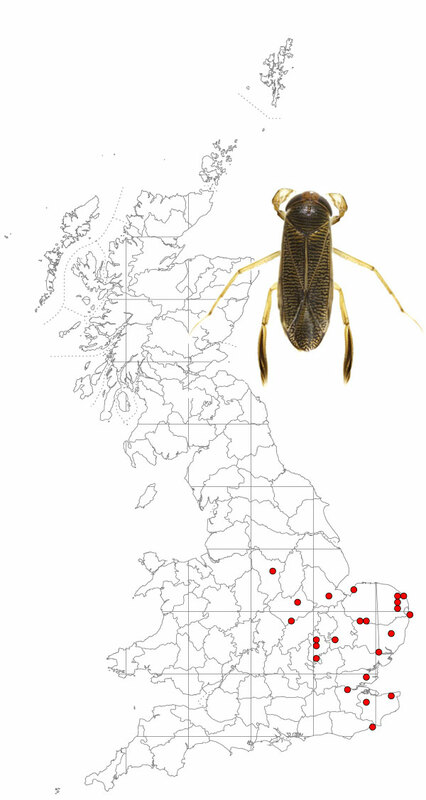 The corixid, or lesser water boatman, Sigara iactans is a species new to Britain, first recorded on the North Norfolk coast at Snettisham in 2005 (Brooke 2005) and since then at other sites in various midland and south-eastern counties (see map) . Sigara iactans is closely related to the common native species S. falleni and may well have been overlooked for some time before 2005 – in fact is was found in a sample from the Norfolk broads collected in 2004 that was re-examined in the light of recent discoveries (Sheila Brooke, pers. comm.). The two species look very similar and often occur together in a range of habitats with a preference for sparsely vegetated sites with little organic matter. Sigara iactans ands S. falleni are reliably distinguished by the difference in the shape of the male palae, the enlarged and flattened front tarsi characteristic of corixids, and in the alignment of pegs on their ventral surface. S. falleni has a pala with a more pronounced, deeper basal lobe (the rounded ‘shoulder’) and a diagonal line of pegs which, if continued, would meet the inner (proximal) end of the short row of pegs situated in the middle of the upper border. In the case of S. iactans the basal lobe is smaller and the diagonal row of pegs line up with the outer (distal) end of the top row of pegs (see below). Females of the two species are hard to separate.